Ya’ll. The tiny human I made now is mobile! As of December 27, 2012, she can look at something, decide she wants it, then, go get it! I’m thrilled/terrified. This moment was shocking for two reasons: 1) she’s never crawled more than six inches before (on Dec 23), and 2) she was crawling in order to get to the The World’s Most Annoying Toy that you all must go buy right now, because it makes your child–and your skin–crawl, obviously. I know I’m prone to exaggeration, but you just wait until you’ve heard “Listen to the sheep sing! Beh, Beh, Beh, Beh, Behhhhh, Behhhhhhhhhh” 28,000 times. It’s awful. Clearly, Mary had a little genetically modified lamb. Suzianne can’t get enough. 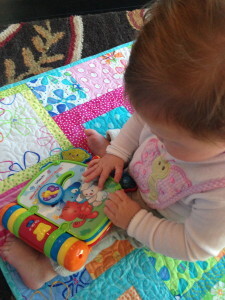 For those of you playing developmental bingo, this means Suzianne crawled for the first time at 9.5 months. That’s a good month or so after “most” babies crawl. So, sister, don’t get all freaked out if your baby is a little behind; they all learn to get around eventually! This entry was posted in Firsts, Milestones, Uh oh. and tagged crawling by Margie. Bookmark the permalink. Hahaha…we have that book. I maybe “dropped” it a little too hard after hearing it one million times too many. Now it doesn’t sing, it just lights up. Perfect!! Love it. Go Suzianne! Maya has a very similar version of this annoying toy – which sings (repeatedly), “Read a book and let your imagination…take you… away.” I sing it to myself all day. I do love how “songs in my head” used to be Prince, or random Broadway show tunes; now, they are toddler tunes!